I'm searching for a small locking toolbox/box that I can mount securely on my bike (2015 gs). 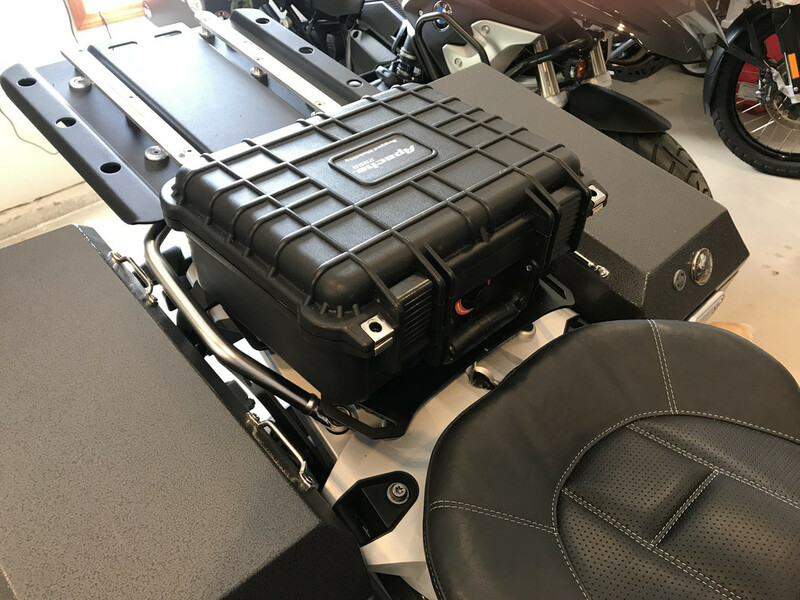 Touratech has one that mounts to the oem pannier rack, not the zega pro version. I have found a few, but again, only for the oem. You have actually done this? I have a Givi that I rekeyed to the BMW key, easy install and easy to rekey. I see that Touratech and Adventure Designs recommend removing of the rear wheel splash guard if riding off road as it will hit and break. Also saw that mentioned on the Wunderlich model 2799116, but only if you have lowered suspension. I rarely carry a passenger so I removed my rear seat and installed a BMW accessory luggage rack, it has a locking cover, underneath I keep a tool roll and pair of leather work gloves. I have a SW Motech pillion luggage plate monted in lieu of the pillion seat. It locks in the forward position making it much more difficult to remove (note: In this picture I had it locked in the rear position). Added a Harbor Freight knockoff of a Pelican Case with four bolts for under $30. It is water tight, lockable and holds tools and air pump with ease. JetSpeed and stevel3007 like this. Yes. For those who have the box, ping me and I'll tell you how to steal it!